With the nursing shortage on the rise, becoming a nurse has never looked better. If you have a non-nursing bachelor’s degree and are seeking a rewarding career in nursing, our new Accelerated BSN program in Cincinnati may be for you. We are looking for qualified candidates for our inaugural class, starting January 2017. Our blended learning model, consisting of online coursework and experiential learning, will challenge your critical thinking skills and expose you to a wide variety of patient care situations while placing you on the path to success. Plus, since a Xavier education is based on Jesuit values, your degree will distinguish you from the rest as you’ll learn to care for the whole patient – mind, body and spirit. Nursing is more than a career; it’s a calling. And, since you’ve found your calling, we are here to help guide you in a purposeful direction. 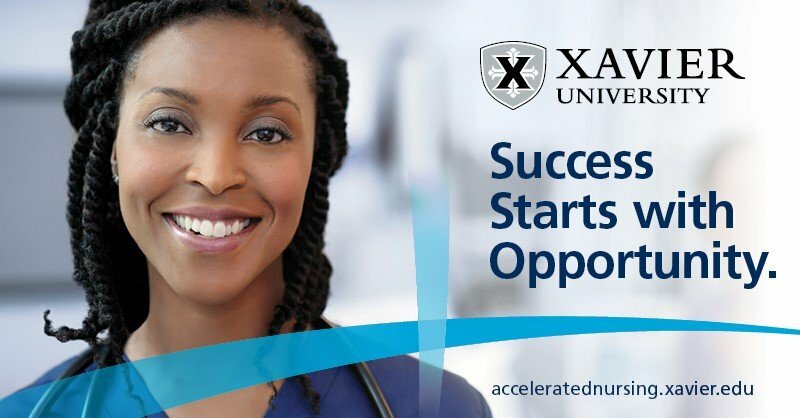 Our Accelerated BSN program in Cincinnati, like all of Xavier’s nursing programs, aims to promote the value of holistic care and a true wellness society. Therefore, these values allow us to shape the future of not only our nursing students, but the patients they encounter during their in-hospital clinical rotations. Through its innovative format, our accelerated second-degree nursing program will provide you with the strong academic foundation and clinical preparedness necessary to take the National Council Licensure Exam (NCLEX). By leveraging your previous academic experience, our full-time, 16-month ABSN program can focus exclusively on delivering a robust nursing curriculum. It requires you to complete 63 credit hours of online nursing theory courses, hands-on learning at our on-site nursing simulation lab and real-world clinical practice at local health care facilities. Online nursing theory coursework is developed and led by top instructional designers in partnership with accomplished nursing faculty. Our online learning system, Canvas, will allow you to interact with the course material in a unique way while building trustworthy relationships with professors and students in your cohort. On-site nursing simulation labs provide a safe space for you to practice basic and advanced nursing skills under the guidance of nursing school faculty. While working with the hospital equipment and high-fidelity manikins in these labs, the point-of-care learning experience you gain will contribute to your confidence and expertise down the road. Real-world clinical practice at local health care facilities prepares students to meet the highest standards of patient care and play leadership roles in nursing. As a Xavier student, the opportunity to make an impact on others and showcase your skills starts with clinical rotations. Clinical rotations are available through Mercy Health, TriHealth, Cincinnati Children’s and The Christ Hospital Health Network, offering you the best possible patient care experiences. Founded in 1831, Xavier University is known for its academic experience. In accordance with the school’s Jesuit values, students at Xavier University participate in various community service projects. During such extracurricular activities, they develop a strong sense of community and connection with their peers. Additionally, thanks to local health care partnerships and three program start dates each year (in January, May and August), our ABSN program in Ohio can accept a higher number of qualified students. And, due to its growing medical community, Cincinnati has a lot to offer students once they enter the job market. There are many benefits that come with a nursing career, such as job flexibility, personal satisfaction, earning potential and the ability to pursue a diverse set of specialties. The Bureau of Labor Statistics states that there will be a shortage of about 800,000 nurses by 2020. In short, the demand for nurses in Ohio and other parts of the country is booming and now is your opportunity to take action. Whether you are seeking a career change or have recently graduated with a BSN in a non-nursing field and would like to pursue nursing, our second-degree accelerated BSN program in Cincinnati could be a great fit for you. Your nursing school journey starts with an admissions counselor. The experienced admissions counselors at Xavier University are here to answer questions, review transcripts and discuss the eligibility requirements for the program. Stay on task during the application process. Develop a personalized academic plan. Champion your future career in nursing. Becoming a nurse will change your life. Are you ready to embrace that change? If so, the inaugural ABSN program in Cincinnati kicking off in January, our enrollment process is in full swing. So, if becoming a nurse is something you’re serious about, please contact our admissions team at 866.890.9467.